G.R.P. Hull, decks and superstructure with fixed keel ,fin and skeg. Lead ballast. Slab reefing. This yacht can sleep 8 as there is a double berth in the fore cabin, with another in the salon plus three singles and a navigators berth aft of the chart table. There is a heads with shower. The galley has an ENO 3 burner hob and oven cooker. 12v refrigerator. There is 400 litres water capacity in two tanks. Fully carpeted. The engine is a Bukh DV20 with 2-blade propeller. 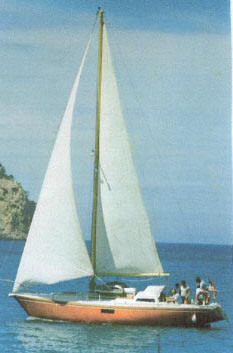 Mainsail, genoa , No. 1 jib, No.2 jib, stonn jib iri Terylene, made by Task. Spinnaker in nylon, made. by -Task. Cruising chute in nylon. Alloy spars, stainless steel rigging. LEWMAR winches. Bombard Axe 3 dinghy with Mercury 2.5hp outboard engine.1 x 6 man liferaft. She has been a liveaboard boat for 18 years, is fully equipped, spacious and comfortable with loads of storage space. To enlarge pictures please click above. Tax and VAT paid in Cyprus.